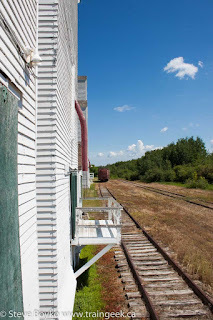 As part of my northwest Manitoba grain elevator trip, I visited the elevator row in Inglis, Manitoba. I wrote about the outsides of the elevators here and now I'm going to write about the interiors. 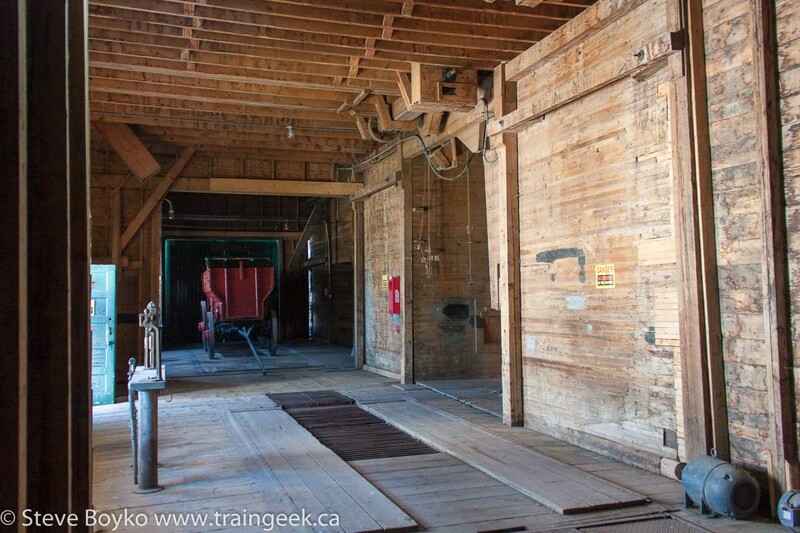 The Paterson elevator in Inglis is open to the public. 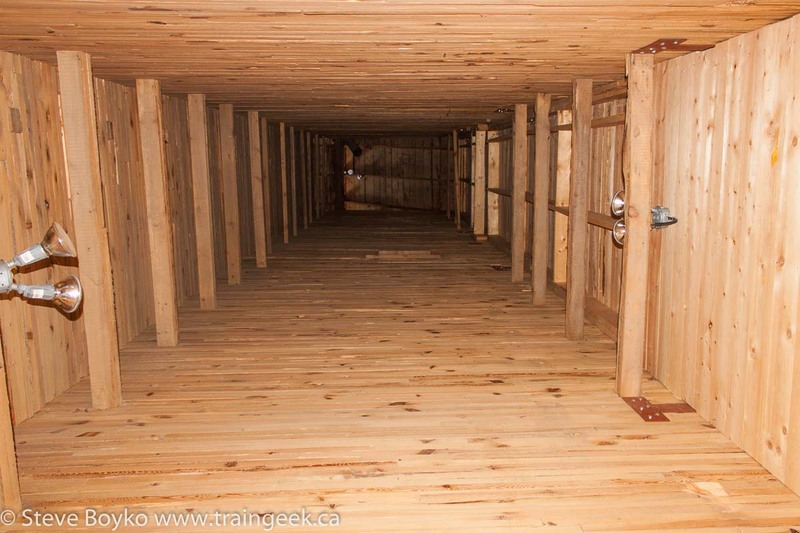 You can stick your head in one of the 20 bins to look up to see how far up it goes. I used flash to illuminate it as far as I could. I think this bin has been modified somewhat as I don't think they would have had those horizontal boards - a place for grain to accumulate. 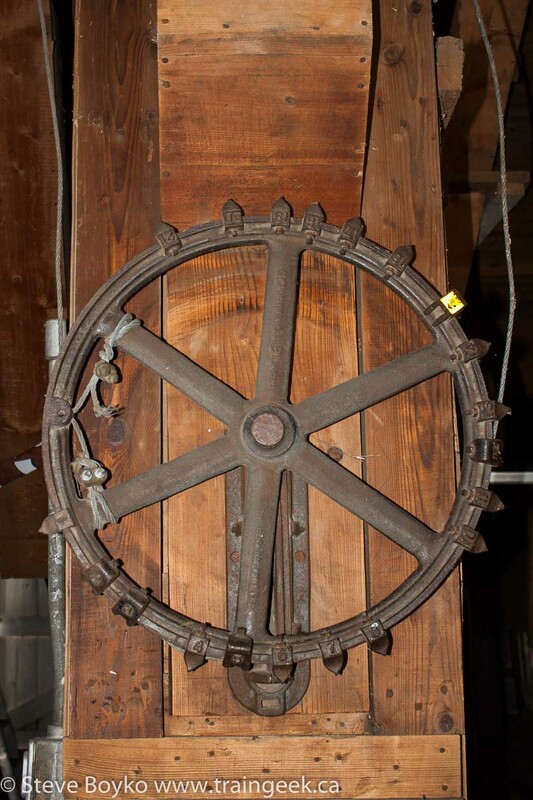 This is the selector wheel, used to select which bin the grain would flow into. This is the manlift for the elevator. Basically you step on it, step on the bar across the floor to disengage the brake, then pull on the rope hand-over-hand to pull yourself (and the platform) up. There are counterweights to make the job easier. On the way down you simply step on the brake lever and you glide down. 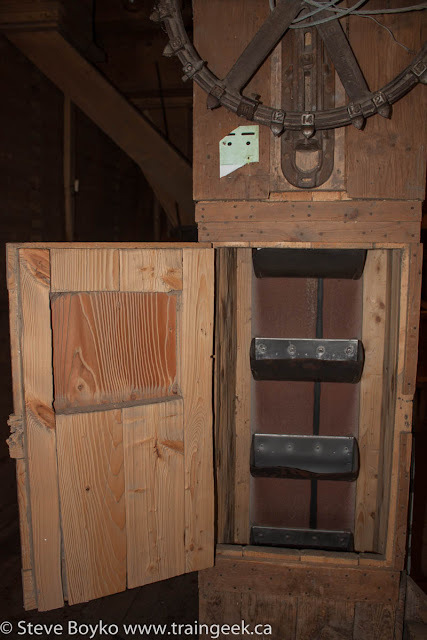 The counterweights are calibrated to be a little less weight than the operator. Obviously people who weigh significantly different than the operator can't use the manlift very well. The manlifts at Inglis are immobile, fortunately. The balloon annex is filled with a photo gallery and a little movie viewing area. It is all very nicely done. 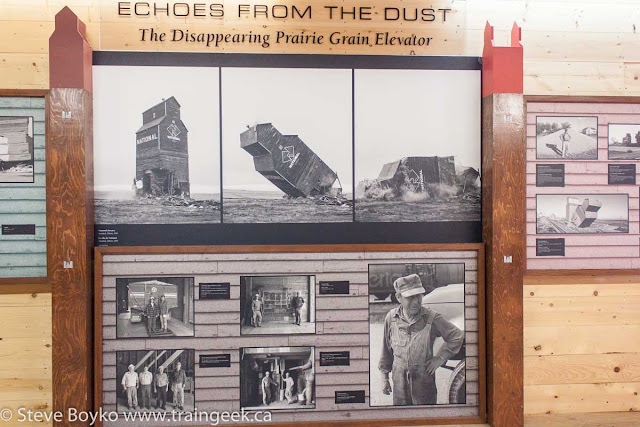 When I visited, they had a display called "Echoes From The Dust: The Disappearing Prairie Grain Elevator". 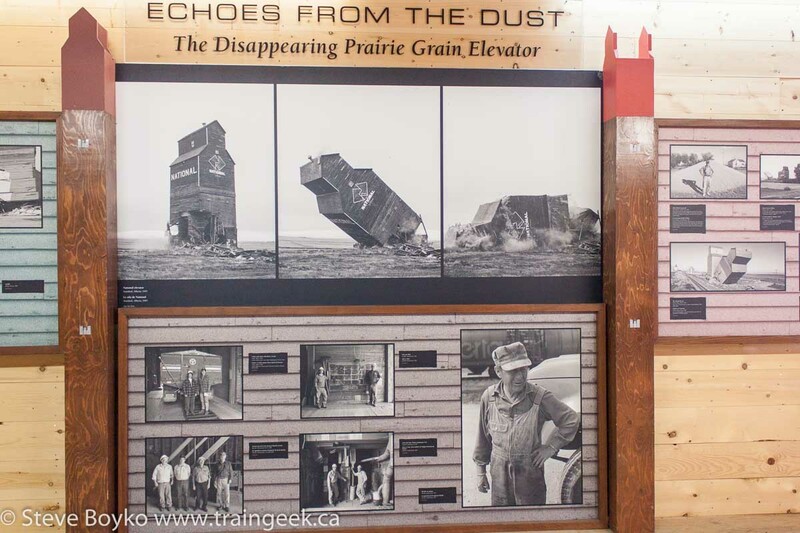 Most if not all were by Tim Van Horn, who has a great collection of grain elevator photos on Flickr. One of the Reliance elevators is also open to the public. Here's the elevator's "leg" with the door open to show the individual cups that bring the grain to the top for distribution into the bins. The selector wheel is visible at the top. Here's a look up the manlift "shaft". 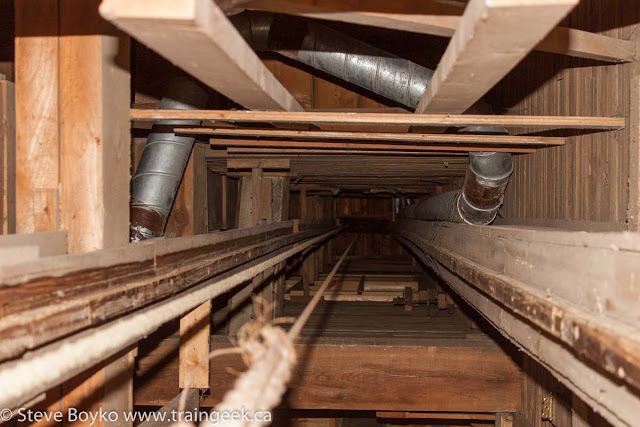 It's not really a shaft at all and the manlifts are pretty crude as far as person-elevators go. 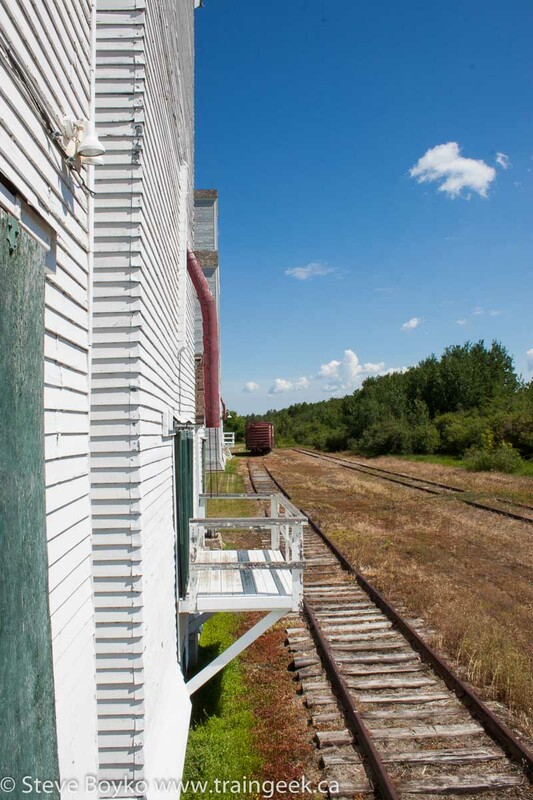 This is the driveway in the Reliance elevator, showing the grating in the floor where the grain was dumped. 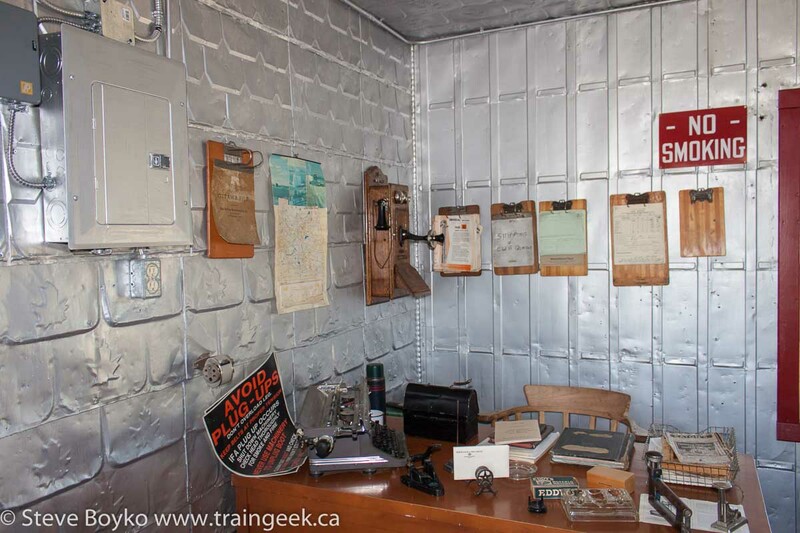 Every elevator had some kind of office, either attached or nearby, where the elevator agent worked. The agent was responsible for the elevator and worked from here when he wasn't in the elevator itself. 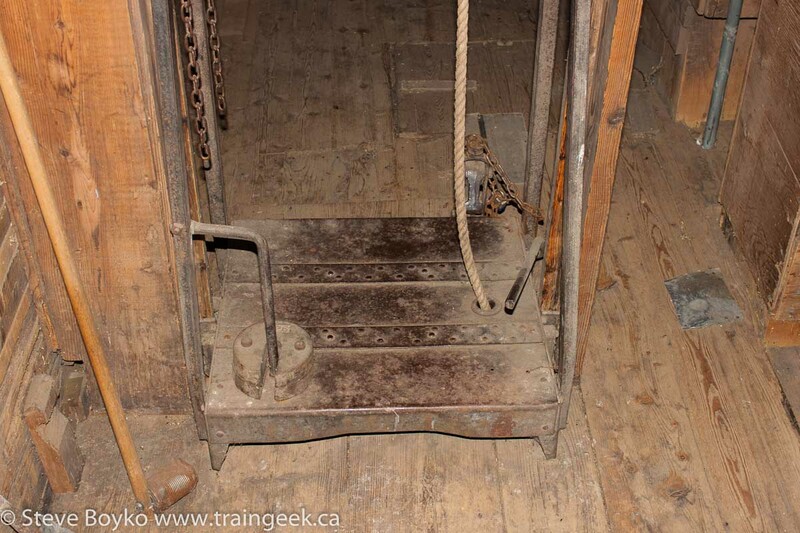 The engine that drove the elevator's leg were generally located in the office building, to reduce the risk of fire from the engine. 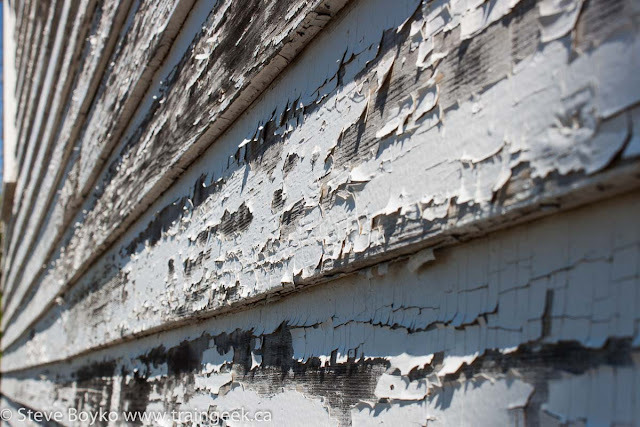 I'm guessing the tin on the walls was to help reduce the fire risk as well. I've seen tin on other elevator office walls as well. 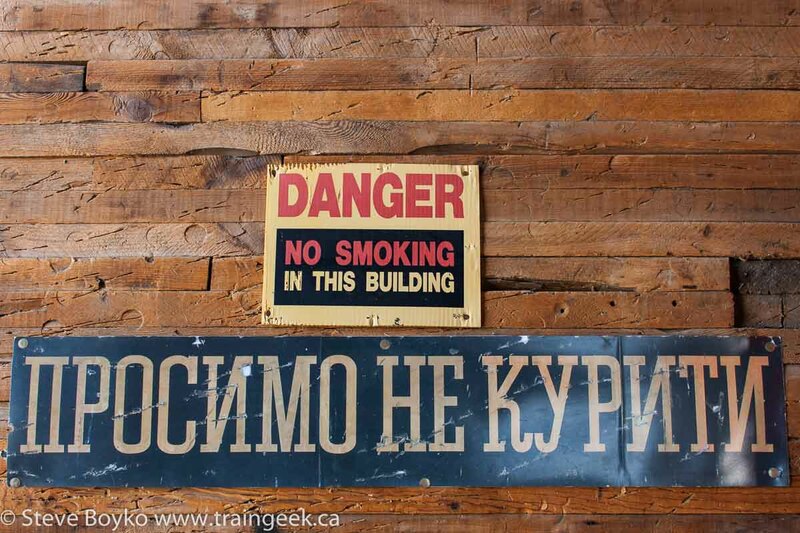 Here are a few signs in and on the Inglis grain elevators. I've seen some of these at other elevators, especially the second "no smoking" sign. Thanks for my guide - she was very helpful - and thanks for reading! Nice post, Steve. Showing the important workings of the elevator. The Museum of Civilization in Ottawa had a pretty realistic interior display, too. I turned a corner, opened a little door and right where I expected it was the man lift! A few years ago, Ax Men ran a brief series featuring a company that specializes in dismantling elder grain facilities, and selling the reclaimed wood as works of art. Great job Steve. next time I'm in Inglis I will take the tour. 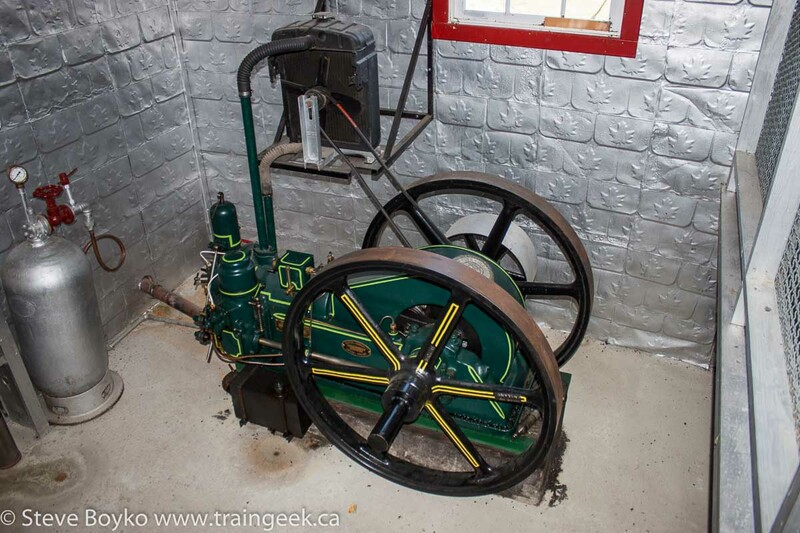 Fascinating look at the early technology that was used by these facilities. I especially like the manlifts. 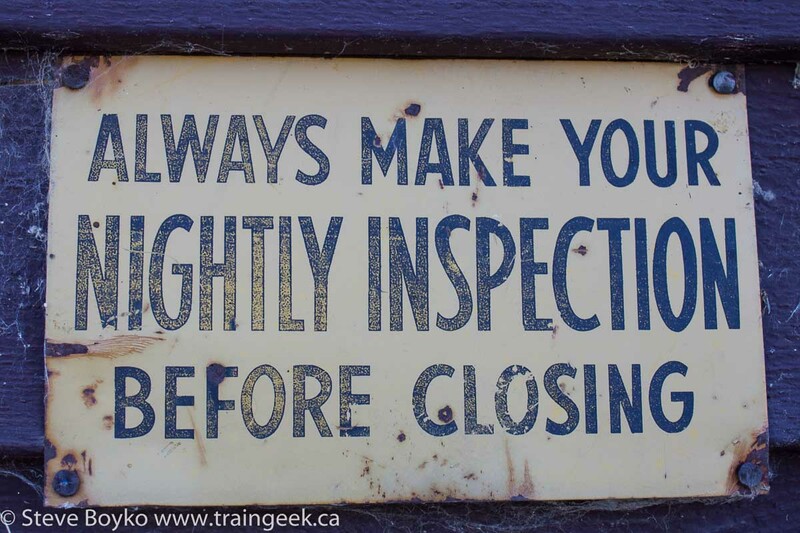 I doubt they would make the cut under today's workplace safety laws. Thank you, Eric! It's been a very long time since I've been to the Museum of Civilization but I'll look for it if/when I return. Robert, that web site Old Globe Wood is fascinating! I love how they documented their procedure for recovering the wood from the grain elevator. It's great to see people repurposing the wood rather than just tearing everything apart with a machine. Thanks, and I hope you like the tour, Lorne! Thanks, Michael. No, the occupational health and safety people would not like manlifts... I've never been in one but I have been in an elevator or two with no walls and it is a weird feeling. Keep your hands to yourself! Good post. Thanks for sharing your amazing experience with us. The writing became more vivid because of the snaps. Hopefully someday, I will be as lucky as you to take a tour to Inglis. I used the Manlift in the Paterson elevator before they closed it and quite enjoyed the ride up, and especially going down. The narrow passage up to the top is not fore the faint of heart! I had to adjust the counterweights a bit (I was much heavier than most of the other folks who went up there.) Once at the topmost work floor I was able to pop one of the roof hatches and climb out most of the way for a cool photo of the leaning (at the time...since fixed) smaller Reliance elevator. It is hard to imagine that the top of the elevator sways in the wind as much as it does...until you are standing on top of it! Again definitely not for the faint of heart! Very interesting, Anonymous! I'm surprised they ever allowed the public to ride the manlift. Thanks for sharing your experience. 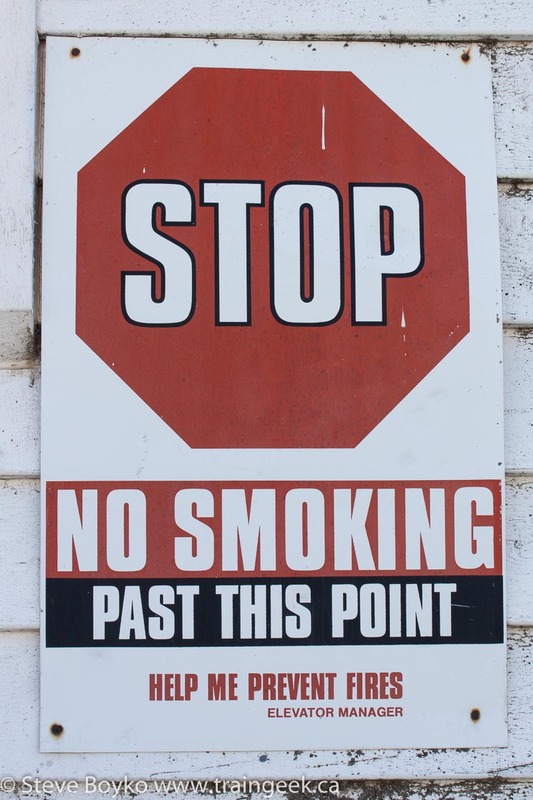 I ran the Ukranian text thru a translator... came out as Welcome No Smoking! Never seen Ukrainian in an elevator before!!! I've never seen Ukrainian in an elevator before either, Celestial2920! Quite uncommon.